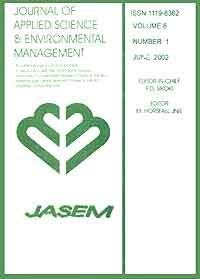 This study examined the medical waste management practices of a hospital in Southern Africa. The results revealed that the hospital does not quantify medical waste. Segregation of medical wastes into infectious medical waste and non-infectious medical waste is not conducted according to definite rules and standards. Separation of medical waste and municipal waste is however practiced to a satisfactory extent. Wheeled trolleys are used for on-site transportation of waste from the points of production to the temporary storage area. Staff responsible for collecting medical waste use almost completes personal protective equipment. Offsite transportation of the hospital waste is undertaken by a private waste management company. Small pickups are mainly used to transport waste daily to an off-site area for treatment and disposal. The main treatment method used in the final disposal of infectious waste is incineration. Noninfectious waste is disposed off using land disposal method. The study showed that the hospital does not have a policy and plan in place for managing medical waste. There are a number of problems the hospital faces in terms of medical waste management, including; lack of necessary rules, regulations and instructions on the different aspects of collections and disposal of waste, failure to quantify the waste generated in reliable records, lack of use of coloured bags by limiting the bags to only one colour for all waste, the absence of a dedicated waste manager, and no committee responsible for monitoring the management of medical waste. Recommendations are given with the aim of improving medical waste management in hospitals.